Can you feel it in your bones? Have you caught the scent of it? Do you see the signs? Now, if you're like me, you change everything just as soon as the last frost of the season has come and gone. I tend to wear deep, warm fragrances in the winter. Cinnamon, Apple, Bayberry... something intense and full of heat. But come spring, I am SO ready for light, fruity, bright, and cool! Ah... the joys of discovery! I found an Etsy shop called Its The Balm. WOW. They have the most amazing, home-made, natural bath and beauty products! Lip balms, scrubs, lotions, sprays, and soaps! I KNEW I had to share that discovery with you! Oh... the fragrance! It takes me back to my home on Tybee and the days spent walking the beach and swimming in the ocean. Seriously, it brought tears to my eyes. You can smell the pineapple, coconut, vanilla, and citrus. It's sensual. It's heady. It's intoxicating! 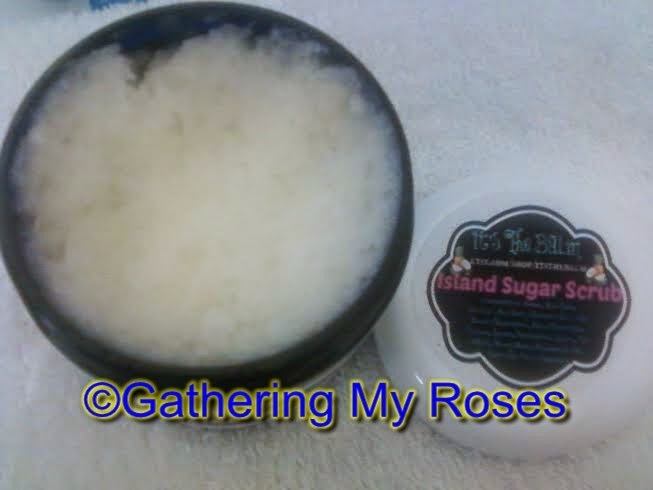 I must admit to being particularly fond of the amazing Island Sugar Scrub. It employs sugar and sea salt to exfoliate the skin and essential oils to soothe and soften. I use it on my hands, elbows, and feet! I know Mike is happy as he is ALWAYS complaining about my rough heels. Used together, you do feel as though you've received a total spa experience. I certainly do. 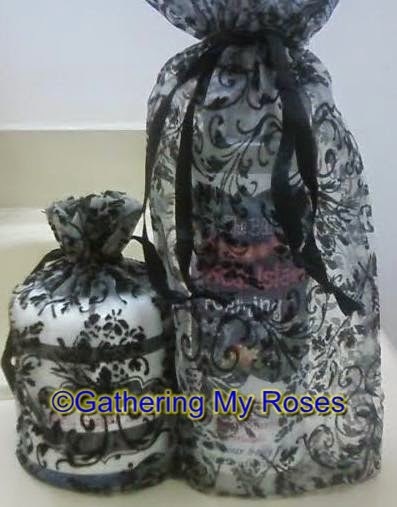 Its aromatherapy, exfoliation, and massage all wrapped together. All of the fine products produced at Its The Balm are made from natural ingredients such as purified water, essential oils, juices, and glycerin. These are quality products made with care and love. I give all credit to Nicole -- the owner and creator of the Its The Balm line! You may connect with Nicole on her website, etsy shop, Facebook, Pinterest, and @OrganicSunshine on Twitter. Nicole has very generously offered one of my readers the opportunity to win the same Spa Kit that I received. Just follow the instructions below for your chance to enter to win! Open to USA, 16+, No PO Boxes, Please. Giveaway ends on 3/26/15. 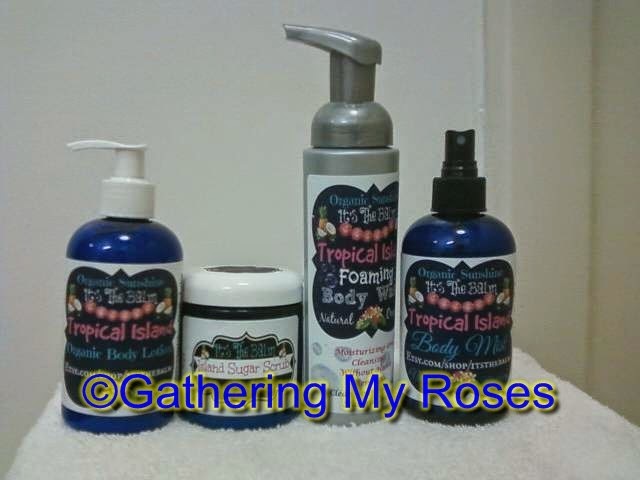 I received the Tropical Island Spa Kit for the purpose of review. I received no monetary compensation. The opinions expressed herein are my own and based on my own use of and experience with the item(s). 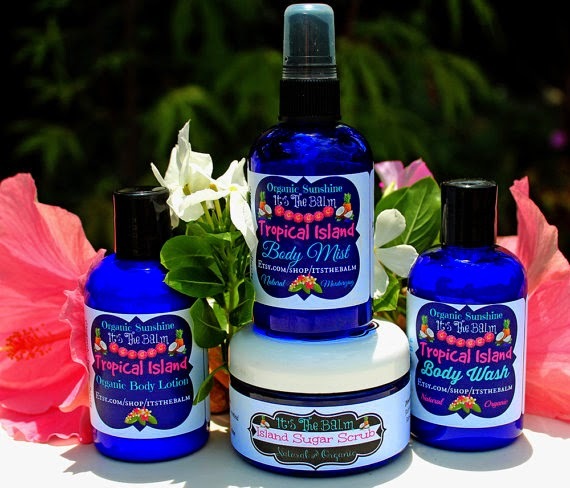 I need this Tropical Island Spa Kit. I am in need of some special treatment. I don't have time to go to the spa and this looks like the next best thing. It sounds like it has a great scent to it too. I love spa kits! They're my favorite type of gifts! Thanks! Hello! I am thrilled to enter your giveaway! Thanks for the entry! I could enjoy and really use this!